Secretary of State Hillary Clinton is supporting a bid by General Electric to export jobs and nuclear technology to China by seeking assurances from Beijing that it will not steal or transfer valuable reactor technology, the Free Beacon has learned. Clinton’s support for a future deal with GE-Hitachi Nuclear Energy, a Wilmington, N.C., company, to make reactor vessels in China for a nuclear plant it hopes to build in India was disclosed in a cable sent Nov. 21 to the United States Embassy in Beijing. The cable directs embassy officials to seek Beijing’s assurances that GE-Hitachi nuclear technology would not be transferred to other states or stolen, as outlined under the terms of a 2003 U.S.-China agreement on nuclear technology cooperation. Disclosure of the Obama administration’s support for GE-Hitachi’s bid to manufacture nuclear goods in China comes as GE’s chairman and CEO, Jeffrey Immelt, continues to head the President’s Council on Jobs and Competitiveness, which advises President Barack Obama on ways to improve the nation’s economy and create jobs. GE also came under fire last year from Pentagon technology security officials over the company’s joint venture with the state-run Aviation Industry Corp. of China (AVIC) over concerns China would covertly obtain U.S. jet avionics technology that could bolster its growing force of advanced jets. On nuclear cooperation, Clinton stated in the cable that the Embassy should seek the technology security assurances on behalf of GE-Hitachi because the company had appealed to the Department of Energy’s National Nuclear Security Administration regarding the non-transfer of technology issue. The Energy Department then asked the State Department to make the request. GE-Hitachi builds advanced nuclear reactors and wants China First Heavy Industries Group, a state-run Chinese company that is directly involved in Chinese nuclear weapons production, to build major components. According to the cable, GE-Hitachi is considering whether China First Heavy Industries would build reactor pressure vessels—special high-strength tanks that are key reactor components. The vessels would be used in GE-Hitachi’s plans for a nuclear power plant in India that uses the company’s unique design called a simplified boiling water reactor. Both GE-Hitachi and Westinghouse, another nuclear energy equipment manufacturer, are seeking deals with the Nuclear Power Corp. of India to build nuclear reactors, although negotiations are continuing. What GE calls the Economic Simplified Boiling Water Reactor is a new design that the company says provides better safety and security, is better suited to withstanding earthquakes, and provides greater economy. The high-tech reactor is "the safest current nuclear plant design," according to a GE fact sheet. China has been identified by the CIA and Congress as a major proliferator of nuclear weapons and other weapons of mass destruction and also is among the most aggressive states engaged in economic espionage. According to China First’s website, the company is engaged in both civilian and defense manufacturing. It described the company as "one of the fifty-three backbone enterprises under the management of the central government that directly related to the national security and economy." The company also makes tunneling equipment, an indication analysts say shows its close involvement with what has been dubbed China’s Great Underground Wall, a network of some 3,000 miles of tunnels used for both storage and production of China’s growing nuclear and missile arsenal. A U.S. official who is critical of the Obama administration’s cooperation with GE-Hitachi on the Chinese nuclear manufacturing said Clinton was helping export U.S. jobs to China through the effort. "You have our nuclear technology sold to the Japanese and now they are asking for the Chinese to build these major components," the official said. "It’s getting rid of jobs needed by the American people." A State Department official confirmed that the Chinese were asked about the technology transfer assurances under the 2003 accord. 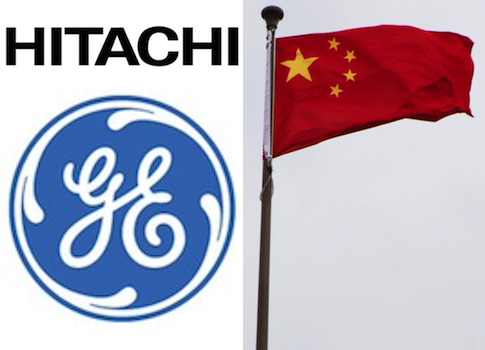 The official said in a statement: "In line with the above-mentioned standard process, the U.S. government did recently request such assurances from the Chinese government in connection with transfers of technology by GE-Hitachi to China." GE-Hitachi spokesman Christopher White confirmed that in the past the company made preliminary inquiries about production arrangements in China, including with China First Heavy Industries Group. "We are always exploring opportunities to broaden and diversify our supply chain in the global marketplace we operate in," White said in a statement. "This exploration, as it relates to Chinese manufacturers, is limited in nature and dates back more than a year." White said the company’s priorities are "to always seek and gain the necessary U.S. government approvals to explore these options and to vigorously protect the intellectual property we have amassed over our 50-year history of leading the nuclear industry." According to the cable, Clinton was seeking assurances that China would not retransfer U.S. nuclear technology under a September 2003 agreement between the United States and China that stipulated U.S. nuclear technology would not be retransferred by China to other countries without prior U.S. approval. The pact was designed to prevent China’s support for weapons of mass destruction program in places like Pakistan and Iran. China was a major supplier of nuclear weapons technology to Pakistan, providing Islamabad with both warhead design and nuclear material production technology and equipment. U.S. intelligence reports from earlier this year revealed that China is covertly helping Pakistan modernize its nuclear facilities and nuclear weapons, including the design of a new warhead. The intelligence reports on proliferation so far have been ignored by Obama administration policymakers who have suppressed the intelligence to avoid upsetting both China and Pakistan. Iran also has received nuclear goods from China. Former State Department intelligence analyst John Tkacik said China has a reputation for stealing advanced technology like the kind that would be involved in a GE-Hitachi deal with China. "Stealing foreign technology and intellectual property is a standard business model for virtually all Chinese companies, including the biggest," Tkacik said. "China's biggest telecom firm, Huawei, stole Cisco Systems' designs and software for routers, built pirated knockoffs, and now competes worldwide with Cisco," he added. Also, China's largest wind power firm stole designs and software from American Semiconductor and then refused to pay the U.S. high tech firm money that it owed, prompting American Semiconductor into a financial crisis that cost thousands of American jobs, Tkacik said. "This happens all the time, but Washington has never retaliated effectively," he said. A Congressional Research Service report published last month said recipients of Chinese technology "include Pakistan and countries said by the State Department to have supported terrorism, such as Iran." The CRS report said the CIA in 1996 uncovered China’s sale of a special industrial furnace and high-tech diagnostic equipment to Pakistan’s unsafeguarded nuclear facilities. China also sold Pakistan ring magnets used in equipment that made fuel for nuclear bombs. A Shanghai company pled guilty in a U.S. court in 2010 for illegally exporting U.S.-made high-performance coatings to China that were used in Pakistan’s Chasma-2 nuclear reactor. China also was linked by U.S. officials to the covert nuclear supplier network led by A.Q. Khan that sold nuclear arms technology to Libya, Iran, and North Korea. A CIA report to Congress in February said Chinese state-owned firms "continue to engage in [weapons of mass destruction]-related proliferation activities." The U.S. government in recent years imposed sanctions on Chinese companies for the illicit transfers, the report said. This entry was posted in Politics and tagged China, General Electric, Hillary Clinton, Iran, Nuclear Weapons, Pakistan. Bookmark the permalink.